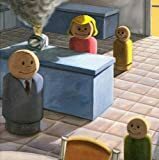 On their debut album, Sunny Day Real Estate set the blueprint for countless bands often referred to as "emo" in the decade following its release. I find this term to be incorrectly used these days, with people referring to every new cheesy pop-punk band on Mtv as "emo" (Fall Out Boy, anyone?). Regardless of the negative connotation that "emo" music has recieved in the past few years, Diary is a very brilliant album with crashing anthems about love and loss that was years ahead of its time. The album starts out strong with the driving "Seven", and then gets even stronger with "In Circles". Next comes the man vs angel dialogue of "Song About an Angel", and then the introspective "Round". From that point, the album continues with songs that push the boundaries of music. Call it emo... Call it indie... Call it punk... Call it punk... Call it alternative... There's really no way to pigeon-hole a band like Sunny Day Real Estate into one specific genre. With Jeremy Enigk's haunting vocals that go from whisper to scream without skipping a beat, Dan Hoerner's intricate guitar parts, and the backbeat of drummer William Goldsmith and bassist Nate Mendel, this is an album that should not be missed by anyone, no matter what type of music they enjoy.